Looking for the very best in 21st century painting? With this ‘plien aire’ study you have found it. Gaillac, in the heart of L’Occitane, a region long aeons famous for wines chosen for kings. By Gordon Frickers measuring 40 x 50 cm (16″ x 20″), oils, available, £1,500. described as “more than a match for anything in the Musee d’Orsay“, by the acclaimed Gaillac historian and author Alain Soreano, when Alain introduced the inaugural showing of this ‘Gaillac Collection’ at the Maison Culturale, by invitation of the Ville de Gaillac, an exhibition during December 2016. Produced ‘plien aire’, literally painted in one glorious ‘hit’ on location. There was of course some very careful preparation. Gaillac, at the heart of L’Occitane has for long centuries been the navigable head port of the capricious river Tarn. River captains would say, “towards Gaillac” so that became the name of the regional wines, Gaillac despite nearby Albi being the larger town and regional ‘capital’. Here you see part of the Abbaye St Michele, part of the old port where in 1860 over 200 barges (gabarre) were registered at la capitainerie du port. The history of Gaillac as a port is known to run back at least as far as Phonetician times, pre Rome. The bridge is the fourth recorded bridge built at Gaillac. This road approaches from a spur of the autoroute, ‘La Route Pastel’ and is without doubt the most picturesque way to enter Gaillac particularly for your first time. Your visit to Gaillac starts well with easy parking by or near the Abbeye St Michele, tourist and wine information available at the old Abbey. This part of the extensive old quarter, in former years bustling with commerce for the capricious river Tarn is a good place to begin exploring this picturesque old town. 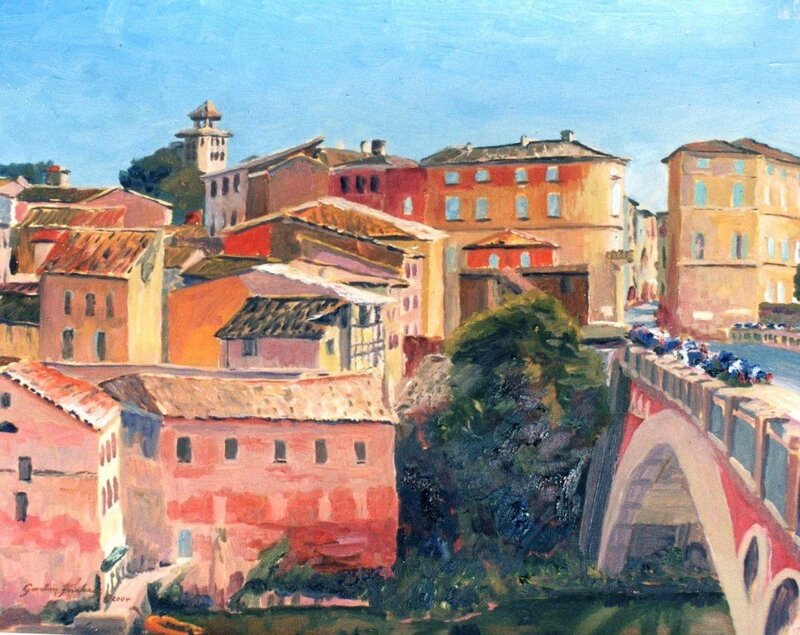 Gaillac was at the navigable head of the river Tarn, a busy port from pre history until the arrival of the rail way, the painting “The Port of Gaillac 1863” commissioned for the wine museum at Broze gives a good idea of Gaillac at the height of it’s port life.